Nowadays, to be on edge, modern manufacturing automation systems have to be involved. Usually they consist of numerous different IT systems located at business management/operation and process control levels. It is broad class of applications domain where business IT and control systems are converged to make a large whole with the aim to improve performance as the result of the macro optimization and synergy effect. This domain is called Industrial IT. Frequently the systems are distributed geographically in multi-division organizations. To deploy the mentioned above convergence the systems have to be integrated – must interoperate with each other. From integration we should expect improved performance as a result of synergy and macro optimization effects. After integration the systems should make up a consistent system, i.e. each subsystem (as a component) must communicate with each others. The final information architecture is strongly dependent on organization, culture, type of technology and target process. Communication is necessary for exchanging data for production state analysis, operation actions scheduling, supervisory control and task synchronization in the process as a large whole. Vast majority of enterprises declare that difficulties with the integration of the existing systems are the most important obstacle to expand the process control and business management support. Other major integration problems are diversification of the existing systems, their quantity and non-unified data architecture. Integration process results in Large Scale Distributed Network Control Systems (LSDNCS). Systems belonging to this class are usually created in a multi-step integration process. To succeed, the process has to be governed by a well-defined information and communication architecture. We must be aware that establishing an association we are actually building information architecture – system structure. It is worth stressing that selection of the architecture development has a great impact on the final robustness, maintainability, expandability, dependability, functionality, and last but not least implementation costs. Peer to peer approach: Common integration practice is to achieve short-term ad-hoc objectives by manually creating/proprietary dedicated point-to-point links between the subsystems everywhere it is useful (see fig. 1). 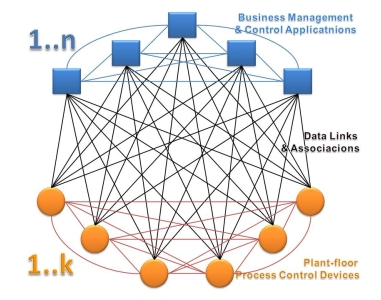 Using randomly this approach we can establish numerous independent links ((k+n)(n+k-1)/2 where k, n – number of business and process control components appropriately). The number rapidly grows, e.g. it is equal 1770 links for n=10 ; k=50, and finally we have to deal with rapidly growing complexity leading to the communication chaos, which is difficult to be maintained. In this model the information and communication architectures are closely coupled. This approach is very popular, but adversely affects all of the solution features. Totalitarian approach: One option to overcome the communication chaos problem is to use an “all in one” product dedicated to both functions: process control and business management (see presentation). Usually, it is provided as one complex, total system – let’s call it a supper-system. Most of the MES (Manufacturing Execution System) vendors offer theirs products as a panacea for all problems of the chaotic system integration. Actually supper-system does not solve the problem, it only hides it under a not transparent cover and makes the solution very difficult to expand and vendor related forever. In this model the system distribution is reduced, and as a consequence many associations can be instantiated on the same platform without necessity to communicate. This model reduces complexity by reducing communication needs. If strictly observed it could be a dead end. Process Observer approach: The Process Observer is a consistent, homogenous real-time representation of the process control layer. It is a kind of the virtual layer, which is a “big picture” of the underlying process layer composed of unit data randomly accessible by means of a unified and standardized interface (see presentation). It allows sharing data from plant floor devices by the process and business management systems, using international standards of data exchange. Process Observer is like a bridge connection between the plant-floor control and the process and business management levels. Thereby, the structure of the links becomes systematic and the existing functionality of the upper layers is preserved. Now, they can gather the process data in a unified, standardized way (see fig.2). Using the Process Observer archetype the number of links between components can be substantially reduced and, what is very important is a linear function of the number of nodes. Process Observer model greatly reduces the whole complexity and decrease dependency by decoupling application associations and underlying communication routes. Additionally, it allows applying systematic design methodology and building information architecture independently of underlying communication infrastructure. Talking about acceptance and adoption of OPC Unified Architecture we usually focused on uniqueness and remarkable features of this standard with the goal of sending the message: “OPC UA is the best interoperability standard – it is much better then other classic solutions ever available” to the community. Additionally, we are sending (circulating) this message over and over to other members of our close OPC UA community. My concern is if it is an effective approach because it looks like “the old shoes syndrome” – it is not enough to buy new ones only because there are much better new ones. We should rather say “don’t use your old shoes while jumping onto your windsurfing board only because they are comfortable – it is not very sensible”. On the grounds of my personal experience I am trying to imagine new unexplored yet fields of potential applications of the OPC UA. It is obvious that their number is uncountable, therefore a selection key must be applied. To follow the idea from the introduction above the “ENABLER” seems to be most appropriate to flag the technology, solution, application, model, approach, etc. that OPC UA makes possible. 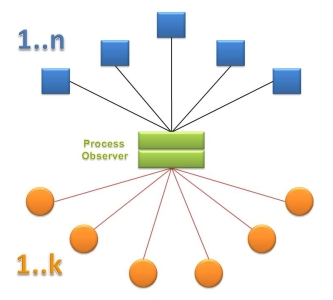 OPC UA Makes Process Observer Archetype Possible: Process Observer is a kind of a virtual layer, which is a “big picture” of the underlying process layer composed of unit data randomly accessible by means of a unified and standardized interface. It allows the process and business management systems, using international standards of data exchange to share data from plant floor devices. Process Observer is like a bridge connection between the plant-floor control and the process and business management levels. OPC UA Makes Complex Data Access Possible: The Industrial IT domain is an integrated set of ICT systems. System integration means the necessity of the information exchange between them (the nodes of a common domain). ICT systems are recognized as a typical measure of processing information. The main challenge of deploying an Industrial IT solution is that information is abstract – it is knowledge describing a situation in the selected environment, e.g. temperature in a boiler, a car speed, an account balance, etc. Unfortunately machines cannot be used to process abstraction. It is also impossible to transfer abstraction from one place to another. OPC UA Makes Highly Distributed Network Control Systems Possible: Nowadays, modern manufacturing automation systems have to be involved. Usually they consist of numerous different IT systems located at business management/operation and process control levels. To deploy the convergence the systems have to be integrated – must interoperate with each other. From integration we should expect improved performance as a result of synergy and macro optimization effects. OPC UA Makes Global Security Possible: We can observe rapid development of globally scoped applications for domains like health, banking, safety, etc. The globalization process is also observed in control engineering. The secure transfer of process control data over the Internet must, therefore, be addressed as the most important prerequisite of this kind of applications. OPC UA Makes Cloud Computing Possible: Cloud Computing is defined as a method to provide requested functionality as a set of services. Following the Cloud Computing idea and offering control systems as a service, there is required a mechanism created on the service concept and supported abstraction and virtualization – two main pillars of the Cloud Computing paradigm. OPC UA Makes Smart Factory Possible: In this case “collaboration” is the key word. Analyzing the collaboration needs of the smart factory we must distinguish two dissimilar targets surrounding the factory: humans and applications. To make this collaboration well-defined in the information exchange and behavioral aspects, the collaboration platforms (e.g. SharePoint) and integration measures (OPC UA) must be integrated. OPC UA Makes Smart User Interface Possible: It introduces a concept of semantic HMI that is an approach to relay the interface on discovering the meaning of process data using the metadata provided by plant floor measurement and control devices. Additionally, network-connected HMI needs special security precautions to be applied. OPC UA Makes Production Traceability Possible: To use analyzers and track selected product and its ingredients parameters, complex data must be managed, i.e. created, transmitted, processed, and saved. To be useful, process data must be exposed in the context of well know semantics represented by the metadata. OPC UA Makes Smart Utility Distribution Systems Possible: Following the concept of smart grids, more and more companies decide to start working on smart utility distribution systems (gas, water, chilly water, or even oil) to improve the performance and availability. The process is dispersed geographically and partially managed by independent operators. An active role of ultimate consumer is very important. All the articles above are OPC UA related. For those looking for more information about this interoperability standard there are two articles providing very basic information, I hope, helping to follow the main topics. OPC UA – Specifications: OPC Unified Architecture is described in a layered set of specifications issued by the OPC Foundation, that are broken into parts. It is purposely described in abstract terms and only in selected parts coupled (mapped) to existing technology on which software can be built. This layering is intentional and helps isolate changes in OPC UA from changes in the technology used to implement it. OPC Unified Architecture: Main Technological Features: It focuses on new features of this interoperability standard including: service oriented architecture, object-oriented information model, abstraction and mapping, security, profiles, robustness. Looking for the new application scope of OPC UA we must face up to managing team work aimed at exploring new undiscovered areas. On the grounds of experience gained while managing variety of innovative process control and business management projects I can say that their scope definition and budget estimation is always the most challenging task. Typically, if the estimated budget of any project is higher than the other ones, the solution provider is recognized as inefficient in one way or another. But there might be another reason if innovative projects are concerned, i.e. the provider’s know-how and extraordinary experience make a better assessment possible. Better always means higher in this context, so typically it puts the solution provider in an underprivileged position and leads to the “more stupid the better” issue. For an innovative project, the main reason why its critical parameters are hardly predictable is its innovative nature. From the definition, an innovation as a translation of an idea or invention into a product or service that creates value is an exploration into unexplored areas. The leader of the team must, therefore, face up to a high level of uncertainty. The following article provides some insights and a proposal with the goal of mitigating this issue. Embedding Agile Principles as Contract Rules: It proposes a methodology framework that tightly couples agile management (to dynamically control the work scope and time framework) to workload tracking with the goal of maximizing the value for money. Feasibilities studies: aimed at describing architecture (re-usable templates) as an interconnection of products making up a structure, product features required to interconnect them in a consistent way, business processes surrounding the solution in question, cost estimation, and solution profitability. Pilot applications: aimed at providing proof of concept and “how to …” cookbook. Best practice guidance: to maintain the quality and minimize application risks. Do not miss this opportunity – you will be welcomed to Poland. From the historical perspective some key words can be recognized as mile stones of the manufacturing enhancement process. These key words describe the main solution or concept that is specific for consecutives eras of development. So the following words hit the big time in history: microprocessor system, automatic processing (PLC), and redundant high availability solution. Today, to be in fashion, we must provide smart solutions, and finally almost everything is smart. We have smart-cars, smart-grids, smart-buildings, and smart-cities. Therefore we must ask, if it is only a buzzword. Going further: can we imagine smart cigarettes? To be honest, I must say that today we do not need artificial intelligence to smoke things like that, but recently I have learnt that cigarettes may have a button to change their flavor on demand – it seems that we are very close to a keyboard concept. What’s more, today it is required that cigarettes are digitally signed to be traceable – it seems that we are very close to the RFID technology and, finally, the Internet of Things concept. Anyway, giving a right answer to this question is only a matter of the definition of the word smart, but nowadays production of cigarettes, as almost everything, is doubtless a challenging activity and needs a steady improvement of the manufacturing environment to compete successfully on the global market. OPC UA Makes Cloud Computing Possible. For someone accomplishing hundreds of control system projects it is not easy to accept the fact that we have adopted most innovative solutions from business technology. Unfortunately, first a programmable calculator was produced and later after that the programmable controller (PLC) appears, first the personal computer (PC) was used to prepare invoices, and later after that SCADA was deployed on the PC. This post is about adoption of the Cloud Computing concept by the process control industry and requirements that must be fulfilled to apply safely this concept. The cloud concept becomes more and more popular in the – we call them disdainfully – office suit, but more officially business management applications. Maybe it also could be widely adopted and will give us new arm to further improve manufacturing efficiency index including cost reduction and improve availability of utilities. Customers Relationship Management (CMS) is a business management application, but controlling a process using PLC is an example of process management. As a rule we do not try to discover relations and possibility to integrate functionality of applications like that. It is like a myth – they have nothing in common – that’s all. Really? Writing this sentence a concept of Smart Grid comes immediately into my mind, where optimization of energy consumption is located mainly on the customers’ site – energy consumers. The above example is used to illustrate as the highly distributed measurement environment can be offered as a service. Cloud Computing is defined as a method to provide a requested functionality as a set of services. There are many examples that cloud computing is really useful to reduce cost and increase robustness. Following the Cloud Computing idea and offering control systems as a service it is required a mechanism created on the service concept and supported abstraction and virtualization – two main pillars of the Cloud Computing paradigm. In my opinion, it can be obtained as the result of set up this mechanism on the foundation of OPC Unified Architecture (see also OPC Unified Architecture – Main Technological Features) that is out of the box solution derived from the Service Orient Architecture principles. Therefore we can say that it is service centric solution. Thanks to OPC UA standard we are able to abstract the process control as the OPC UA Address Space implementing selected, process oriented information model. Address Space is very useful to offer selective availability, as a means to manage the process representation and scope of its exposition to the users – OPC UA Clients. In Cloud Computing concept the virtualization is recognized as possibility to share the services by many users. OPC UA server is a publishing mechanism exposing process data and meta-data to unlimited number of clients, and therefore it fulfills this requirement as well. Multiuser dynamic and global environment causes a risk of unauthorized access and concerns about how cloud reliability and security could threaten manufacturing stability. Because OPC UA engages public key infrastructure – the strongest widely used authentication mechanism – the process can be protected against any cyber attack. All the above lead to the sentence that process control community is well equipped to adopt the Cloud Computing and take advantage of new features that open new fields of applications. The only open question is if the process control community is ready to put trust on the new emerging technology. Agile management is recognized as a methodology that helps us to guide software development projects towards the most valuable outcome possible. The methodology well accommodates inevitable unpredictability of the project that adversely affects the expected results and workload assessment. It is, therefore, a good candidate to be applied to high risk innovative research projects based on a contract. Methodology extension and tools based on the business processes modeling are proposed with the aim of harmonizing and embedding agile principles as contract rules. This proposal is based on the experience gained while managing variety of innovative process control and business management projects. For these and similar projects, their scope definition and budget estimation in advance have always been the most challenging task. Typically, if the estimated budget of any project is higher than the other ones, the solution provider is recognized as inefficient in one way or another. But there might be another reason if innovative projects are concerned, i.e. the provider’s know-how and extraordinary experience make a better assessment possible. Better always means higher in this context and, in a typical bid where budget is the most important factor, it puts the solution provider in an underprivileged position and leads to the “more stupid the better” syndrome. For an innovative project, the main reason why its critical parameters are hardly predictable is its innovative nature. From the definition, an innovation as a translation of an idea or invention into a product or service that creates value is an exploration into unexplored areas. The leader of the team must, therefore, face up to a high level of uncertainty. The main aim of any invention result application is to further satisfy the needs and improve selected processes. But in all cases it is a business process involving at least two organizations: a customer and a solution provider that must cooperate under a contractual relationship, i.e. a voluntary, deliberate, and legally binding agreement between them. The contractual relationship is evidenced by an offer, an acceptance thereof, and a valid (legal and valuable) consideration. It is impossible for the customer to prepare the specifications because it is unaware of the necessity of exploration. It is impossible for the solution provider to prepare the offer as the specifications are inadequate and the unanswered questions can be addressed and worked out as project goals only. The procurement issues described above could be partially solved using direct negotiations or the single-source acquisition method. Unfortunately, both “suffer from” the qualitative nature of the selection process and usually are an exception to the typical procedure. Nevertheless, as the quantitative assessment is difficult or even impossible, they might be a better choice. The discussion about the procurement process is out of this post scope. However, in spite of the selected procurement method, the question how to limit the budget, determine the time frame and define the expected scope and quality in the contract is still open. A new methodology is required to address this question. Its implementation should be non-invasive and effortless but, if strictly observed, it must control the development process to minimize the price-to-performance factor and assure meeting of the customer basic requirements. Agile management to dynamically control the work scope and time framework. Workload tracking to precisely control the value for money. This method is also proposed to be deployed using supporting tools developed on the process model basis to make the deployment straightforward.